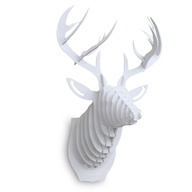 My favorite thing that I have added to my office has got to be my white faux deer head. I bought and hung it last fall, but only now do I really realize how great of a choice it was! What started out as a joke, all of my male coworkers are hunters and fisherman and they have their deer heads proudly on display in their offices, turned into quite a conversation starter. I think Bucky! It is a take on the famous architect Buckminster Fuller, and it is a buck. I think I am soooo punny sometimes.